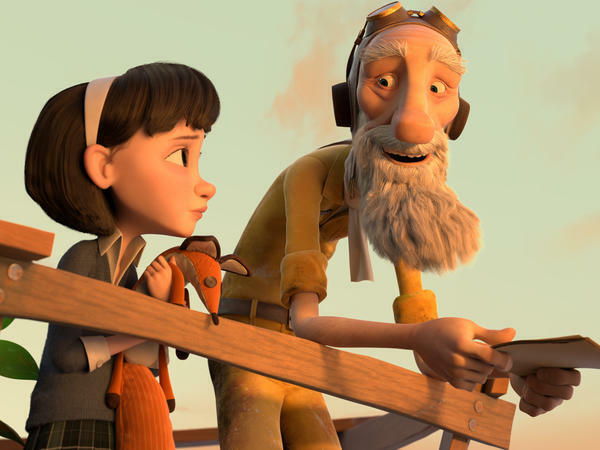 Director Mark Osborne's take on The Little Prince features the voices of Jeff Bridges, Rachel McAdams and Paul Rudd. In Osborne's movie, a 9-year-old girl is introduced to The Little Prince by its author, an eccentric former aviator who lives next door. Osborne's film adaptation of The Little Prince has CGI, hand-drawn paper cut-outs and clay animation. In 1943, Orson Welles tried to turn The Little Prince into a movie and even wrote a screenplay for it (pictured). Courtesy of The Lilly Library, Indiana University, Bloomington, Ind. For the record, it wasn't originally Osborne's idea to turn the gentle, beloved story into a big, commercial movie. Saint-Exupéry's estate actually approached him, and Osborne initially turned them down. According to Olivier d'Agay, Saint-Exupéry's great-nephew and manager of the writer's estate, "The first response was 'No.' Mark is so honest ... that he was really scared to [consider] an adaptation of this lovely book." For his part, Osborne remembers thinking, "There's no way that you could possibly make a movie that is everything the book is to everyone." Indeed, The Little Prince is many different things to many different people. Where young readers might see a galactic, fantasy adventure, adults might be taken by what the story says about growing older and losing a childlike creativity. Some embrace The Little Prince as a meditation on friendship and responsibility, while others see it as a war story. In truth, it's all of the above and more. "The book exists in the imagination of every reader," Osborne says. "There's a new version of the book that's created every time someone reads it." Like so many others, Osborne has his own, personal history with the book. He met his future wife in New York and while they were dating he moved to California to study animation. "We had a long distance relationship at some point and it was really hard on us," he says. "And she gave me her copy of the book as a way to keep us connected. And she used the quote: 'It is only with the heart that one can see rightly; what is essential is invisible to the eye.' That was the quote that meant a lot to me and to us at that time, because she was saying, If we can't be together, we'll still be together." In the book, that wisdom comes from the fox the Little Prince meets during his journey through the galaxy. The prince is pining for the rose he left behind on his planet, and the fox tells him, "It is the time you have wasted for your rose that makes your rose so important." Osborne says his own memories of the book got him thinking about what kind of movie might be possible. "I couldn't stop thinking about the idea of expanding on the book," he says, "or using the book as sort of the beating heart at the center of a larger story that was about the experience that one can have with the book." 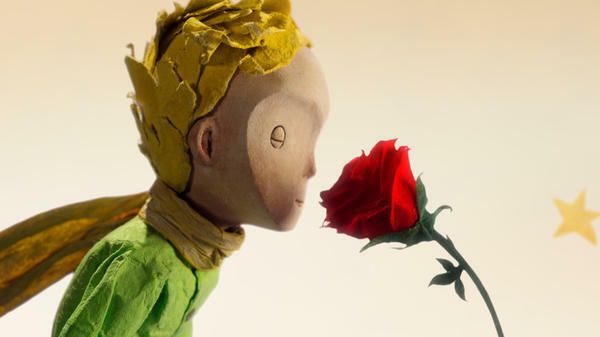 In Osborne's movie, we follow a 9-year-old girl's experience of reading The Little Prince. She is introduced to the story by its author, an eccentric former aviator who lives next door (a fictional stand-in for Saint-Exupéry, had the pilot not disappeared, at age 44, on a reconnaissance flight over occupied France). Whenever the girl or the pilot read the story, Osborne completely changes the look and feel of the film, from computer-generated images to hand-drawn paper cut-outs to clay animation. "Making a film of such a beloved story is a real risk," says Christine Nelson, a curator with the Morgan Library and Museum in New York, where Saint-Exupéry's original manuscript for The Little Prince is preserved. A few years back, Nelson curated an exhibition on the book. She says it has a fraught history when it comes to adaptations. Welles wanted to make a live action film with some animation, and in the 1940s that meant working with Walt Disney. So Welles reached out. Nelson says, "He went to this meeting with Walt Disney and told him his vision and they were talking together and apparently Disney stormed out of the meeting saying, 'There's only room in this project for one genius.' And so the whole thing fell apart," A clash of grown-up egos that wouldn't surprise the Little Prince one bit. In 1974, director Stanley Donen, who made Singin' In The Rain, came out with a very campy, musical version of The Little Prince. Gene Wilder plays the fox in an orange suit and tie, and Bob Fosse — looking a lot like Michael Jackson, circa "Billie Jean" — is the disco-dancing snake. Most critics felt the stars did not align for Donen's attempt, but Nelson believes Donen's biggest problem was the 6-year-old actor who plays the planet-hopping protagonist. She says the Little Prince is a tough role to cast. "He has to have the sweetness and silliness of childhood. He has to have that deep earnestness of a child. He has to show a little bit of world weariness, of someone who's traveled the world and witnessed loneliness and isolation. And, in the end, he has to have this great wisdom. That's a pretty tall order for a 6-year-old." 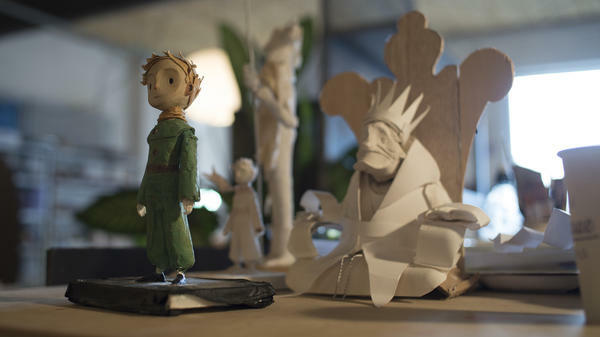 Pity the person who tries to adapt "The Little Prince." The classic story by Antoine de Saint-Exupery is about a pilot who meets a child from another planet. The book has sold hundreds of millions of copies around the world. Now there's a new movie adaptation of "The Little Prince" by a director whose credits include "The SpongeBob SquarePants Movie" and "Kung Fu Panda." NPR's Elizabeth Blair reports. TOM KENNY: (As Spongebob Squarepants) Hurray. BLAIR: ...Would dare touch this literary classic. RILEY OSBORNE: (As The Little Prince) What planet is this? BENICIO DEL TORO: (As The Snake) This is Earth. This is Africa. BLAIR: Turns out, it was Antoine de Saint-Exupery's family that asked Mark Osborne if he would direct "The Little Prince." OLIVIER D'AGAY: The first response was no. BLAIR: Olivier d'Agay is the great nephew of Saint-Exupery and manages the writer's estate. D'AGAY: Mark is so honest guy (laughter) that he was really scared to think to an adaptation of this lovely book. MARK OSBORNE: I just said there's no way that you could possibly make a movie that is everything the book is to everyone. BLAIR: And that's a lot of things - a meditation on childhood, a fable about friendship, even a war story. Mark Osborne has his own history with the book. He met his future wife when he was an art student at the Pratt Institute in New York. While they were dating, he was accepted to the California Institute of the Arts to study animation. M. OSBORNE: We had a long distance relationship at some point, and it was really hard on us. And she gave me her copy of the book as a way to keep us connected, and she used the quote, you know, it is only with the heart that one can see rightly what is essential is invisible to the eye. BLAIR: That bit of wisdom comes from a fox the Little Prince meets as he visits different planets. M. OSBORNE: That was the quote that meant a lot to me and to us at that time because she was saying if we can't be together, we'll still be together. BLAIR: Osborne says his own memories of the book gave him an idea. M. OSBORNE: I couldn't stop thinking about the idea of using the book as sort of the beating heart at the center of a larger story that was about the experience that one can have with the book. BLAIR: In Osborne's movie, we follow a 9-year-old girl's experience of reading "The Little Prince." MACKENZIE FOY: (As The Little Girl) Once upon a time, there was a little prince who lived on a planet that was scarcely bigger than himself and who had need of a friend. BLAIR: She's introduced to the story by its author, a former aviator who lives next door. JEFF BRIDGES: (As The Aviator) He was very fond of sunsets. One day he saw 44 of them. FOY: (As The Little Girl) What? CHRISTINE NELSON: It's a book that so many people claim as their own, and so making a film of such a beloved story is a real risk. BLAIR: Christine Nelson is with the Morgan Library and Museum in New York, the Saint-Exupery original manuscript for "The Little Prince." She says the history of trying to adapt the story is fraught. 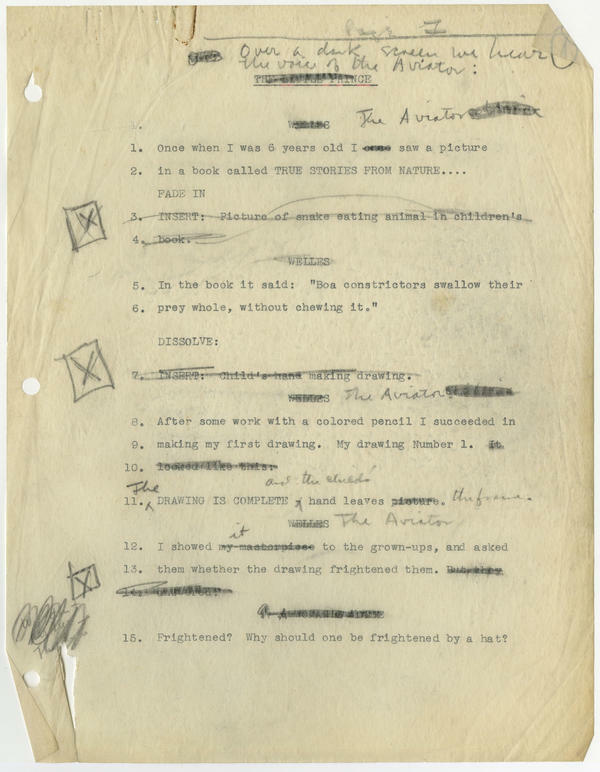 The first person to buy the film rights was Orson Welles in 1943. He wanted to make a live-action film with some animation and approached Walt Disney. NELSON: He went to this meeting with Walt Disney and told him his vision, and apparently Disney stormed out of the meeting saying, you know, there's only room in this project for one genius. And so the whole thing fell apart. BLAIR: Grown-ups, as the Little Prince might sigh. In 1974, Stanley Donen, who co-directed "Singin' In The Rain" came out with a movie musical starring Gene Wilder as the fox wearing an orange suit and tie. BLAIR: It flopped. The Morgan Library's Christine Nelson thinks the main problem was the 6-year-old actor who played the Little Prince, a tough role. NELSON: You know, he has to have the sweetness and the silliness of childhood. He has to show a little bit of world weariness of someone who's traveled the world and witnessed loneliness and isolation. And in the end, he has to have this great wisdom. That's a pretty tall order for a 6 year old. BLAIR: It's also a tall order for certain audiences. What is the audience for this movie? BLAIR: When "The Little Prince" was first published. Christine Nelson says Saint-Exupery never specified his intended audience. He dedicated the book to an adult friend of his, a Jew living in Nazi-occupied France. He asked children to forgive him for dedicating the book to a grown-up. Elizabeth Blair, NPR News. Transcript provided by NPR, Copyright NPR.